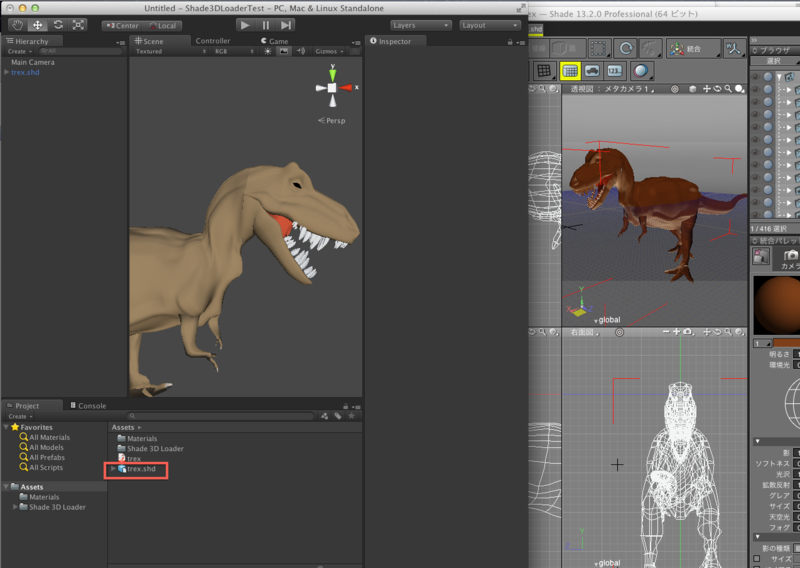 Shade3D Loader provides auto conversion to FBX format when Shade3D scene files (.shd) are added to a Unity project. You will be able to edit your Shade creation in Unity's real time environment. *if you want to use the Shade3D Loader with Shade3D's products, make sure to update to the version 13.2.1. First of all, make sure that Shade 3D for Unity is installed. 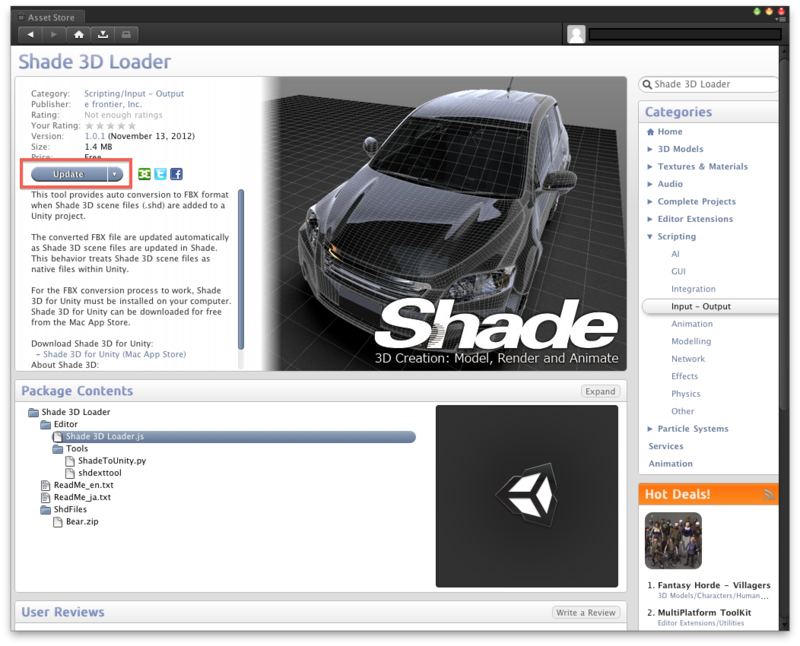 1- Open your Unity's project, from the AssetStore, download Shade 3D Loader. 2- Once the download is finished, open the "Importing Package" window and click the "Import" button. Once this step is achieved, you are ready to start. 4- Wait a little while the FBX is being generated, once it is done, you can put it into your scene and use it immediately. Once a script is imported from the Asset Store, you can repeat the same process and drag and drop more shd file. When you export the FBX file manually, it can be done from : "File>Export>FBX..." in the file menu. When importing Automatically the FBX files into Unity, a special attention should be paid to the points below. 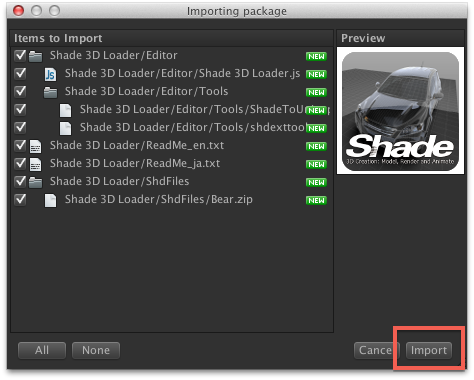 You can get a detailed help in " plug-in manual> import export "from" help> Shade help". - From the menu, select "Reset All Transformation"
When importing FBX files to Unity with the same surface material of a different name, the surface material may not be correctly updated. Furthermore, if you are using the same texture in Multiple Materials, it might not be correctly applied. 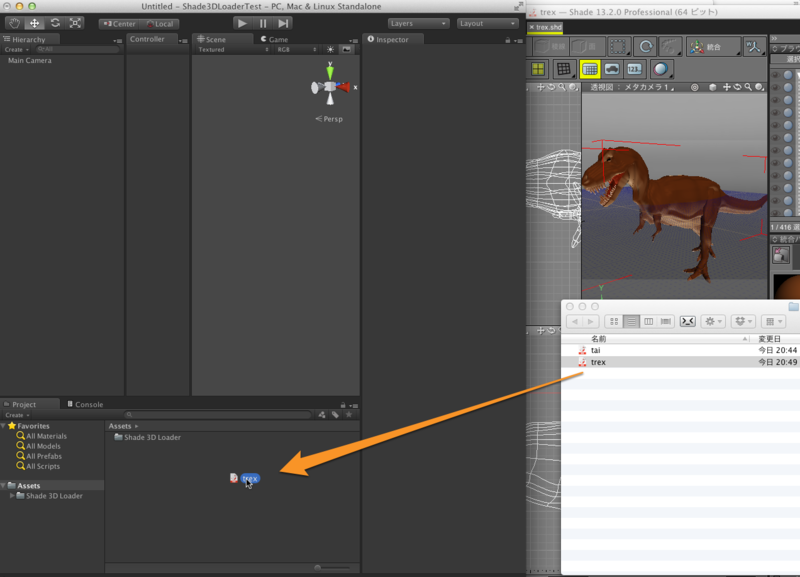 In Unity FBX import settings, select "From Model's Material" in the "Material Naming" pop-up menu. Sometimes, Unity does not read the unit information inside the FBX file. In that case, when you export directly the FBX file from Shade 3D, you can turn off the "Use unit information of the scene".